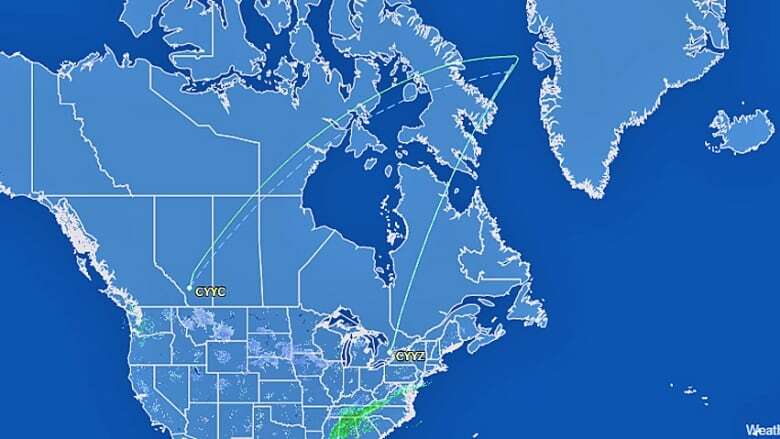 An Air Canada flight from Calgary to London's Heathrow Airport was diverted to Toronto for several hours after "a slight electrical smell" was reported on board. Flight AC850 left Calgary for England at 7 p.m. MT. The Boeing 767 with 201 passengers on board changed its flight path on the western edge of Greenland and headed for Toronto. Air Canada spokeswoman Angela Mah told CBC News that the diversion was done "strictly out of an abundance of caution due to a slight electrical smell detected in the cabin." Mah said the flight landed without incident at Toronto's Pearson airport early Monday. The flight departed Toronto for Heathrow at 7 a.m. ET with a different aircraft. A flight from Toronto to Sudbury, Ont., made an emergency landing at Pearson airport Sunday night. The flight originated at Billy Bishop Toronto City airport, located on Toronto's downtown waterfront. The plane landed without incident. A flight from Toronto to Washington, D.C., made an unscheduled landing in Williamsport, Pa. No one was injured and the plane landed safely. A flight (POE630) from Thunder Bay to Billy Bishop airport instead landed at Pearson. A Porter spokesperson said the diversion was not related to other flights and was made as "a precaution that the captain elected to take based on an indication received in the cockpit." Meanwhile, in England, a Virgin Atlantic jet bound for Las Vegas was forced to make an emergency landing after developing problems with its landing gear.